The Euronext Equity and Index Derivatives product provides real-time tick by tick (full market depth) data for Euronext Equity and Index derivatives. 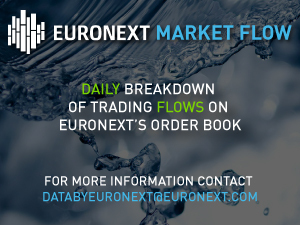 Euronext offers low latency, high-performance data feeds using multicast technology and provides pre-trade and post-trade data from the Euronext Derivatives market. The Euronext Equity and Index Derivatives product provides last trade, best bid/offer, settlement, and open interest information for Euronext Equity and Index derivatives contracts. Index Futures and Options (CAC40, AEX, BEL20, PSI20) are included in the product.